In-kind donations can make a world of difference! 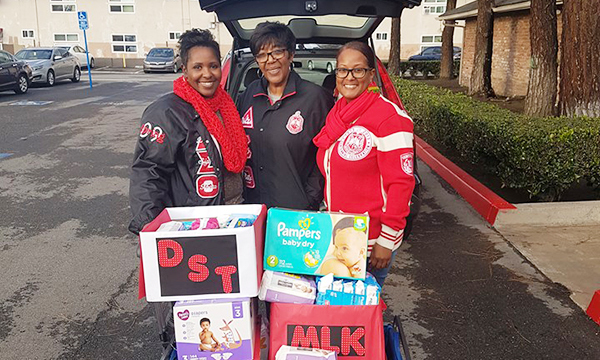 Here, Ronic Tatum, Darylyn Farris, and Nia League of Delta Sigma Theta Sorority, Inc., Cerritos Alumnae Chapter, drop off baby items. Do you ever wonder how you can get involved, and help abused and neglected children, and at-risk families? Well, consider providing for a family or child’s basic needs. 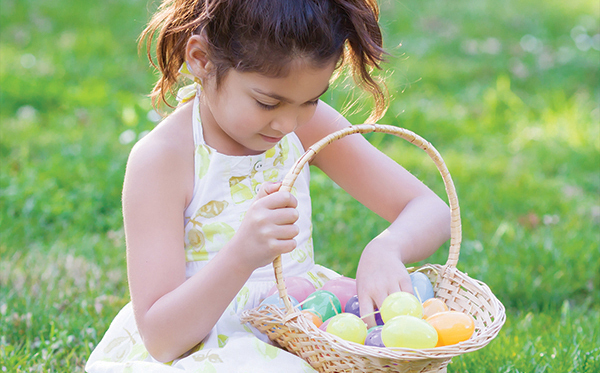 These simple things all contribute to preventing abuse and keeping families stable. 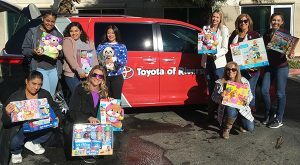 We want to give special thanks to some special supporters in Los Angeles: Girl Scout Troop 4006 for putting together 100 hygiene kits, Delta Theta Sigma for collecting pull-ups and baby wipes, and Girl Scout Troop 16085 for building a new bookshelf and donating books to our Family Resource Center. You are making a life-changing difference in our community! Attendees knelt in prayer at the luncheon to ask for guidance in making a difference for children in Los Angeles County. At the end of January, 330 pastors and church leaders gathered at the Dream Center in Los Angeles to discuss the county’s out-of-control foster care crisis. The largest child welfare population in the country, more than 34,000 children are currently in the Los Angeles County system. The theme of this 2nd Annual Greater Los Angeles Pastor’s Luncheon was mobilizing church congregations to be a significant part of the solution. Anne Moore , Ministry Lead and Foster Parent, Parkcrest Church; Barbara Sunofsky, Families Pastor, Long Beach Christian Fellowship; Dr. Matt Jones, Pastor, Del Rey Church; Jen Toledo, Pastor, Expression 58; and Geremy Dixon, Pastor, Center of Hope shared what’s possible, based on how their churches are engaging in this effort. 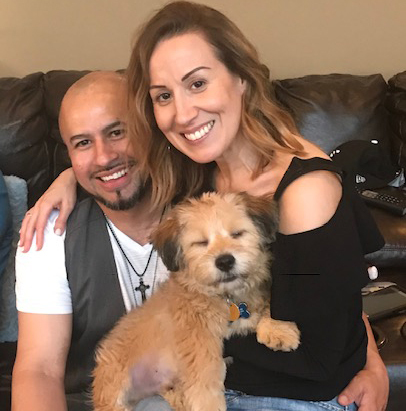 Nick Vujicic, guest speaker from Life without Limbs, called church leaders to take action, and Bobby Cagle, Director of Children and Family Services in Los Angeles County, affirmed the urgency for the community to get involved. Thank you to the Dream Center, Stonefire Catering, Pacific Crossroads Church, Hope for LA, America’s Christian Credit Union, and Storyville Coffee for the support and contributions toward this event. To find out more about how your church can get involved, contact Rebekah Weigel at rebekah-weigel@olivecrest.org. Did you have a Happy Valentine’s Day? We sure did! 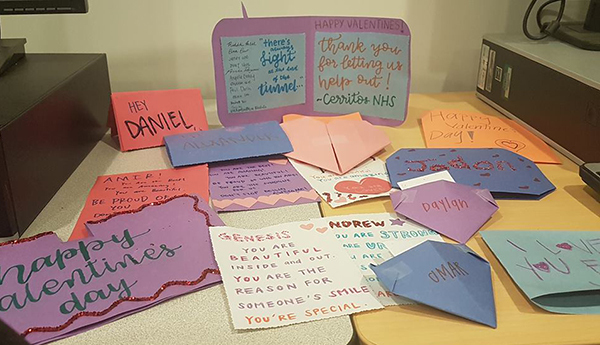 On that special day of love, our LA office received a welcome visit by members of the Cerritos High School National Honor Society, who created beautiful Valentine’s Day cards to encourage the children and families we serve. 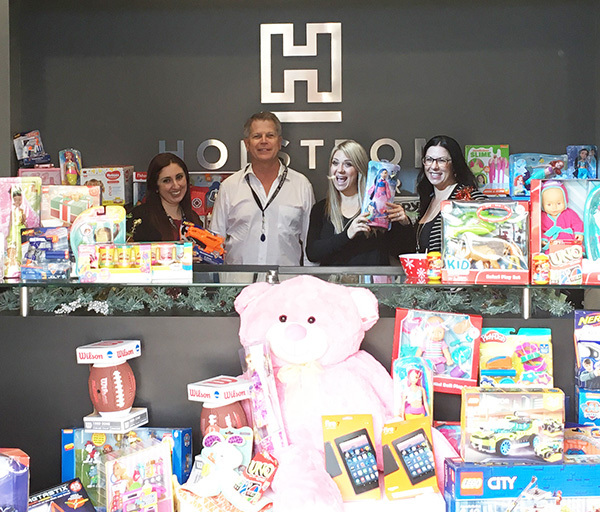 The result was dozens of happy smiles from our kids and families. Thanks to the Cerritos National Honor Society and all of you who share your love with us — not only on Valentine’s Day but all year long. Kids and Families in Los Angeles are Thankful…for You! 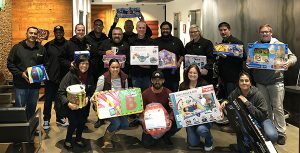 The holiday season may officially be over, but we are still overflowing with gratitude for all the ways the Los Angeles community showed at-risk children and young adults that they are loved. From the youngest little one to the oldest teen and young adult, we pray that a sense of hope, love, and family is felt in the hearts and minds of all involved in this special kind of joy. 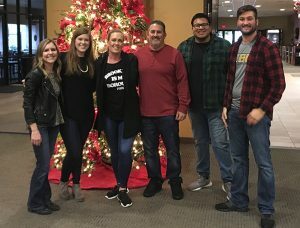 Thank you to Park Crest Christian church, who not only hosted more than 200 Olive Crest kids & families for our annual Christmas party but also provided 31 volunteers. Every child went home with a gift and was given the opportunity to participate in fun activities and get their pictures taken with Santa. SoCal Helpful Honda even came bearing fun gingerbread houses for everyone to put together and take home. What a special day! We also can’t say thank you enough to all the churches that came together for our Christmas party for Olive Crest teens and young adults. 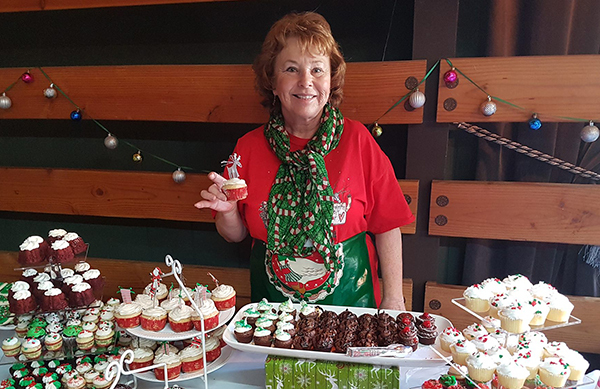 On December 23, they gathered at Olive Crest in Los Angeles to enjoy a Christmas party crafted just for them! So many blessings took place this day! Praise Church West Covina, Impact City, and Eastside Bellflower provided scrumptious food, cookies, hot cocoa and coffee for the evening. Chung and Laura from King’s Church provided $40 Target Gift cards for all the Olive Crest young adults. Oasis LA provided them with a $50 gift card and gift bags. 7th Street Campus provided additional gift cards to really bless our youth. We are encouraged that long past the swell of the season, this impact will be felt. Thank you for helping Olive Crest put smiles on so many faces! We couldn’t do it without you! Olive Crest families received non-perishable food items, plus a gift card, thanks to Pacific Crossroads Church. 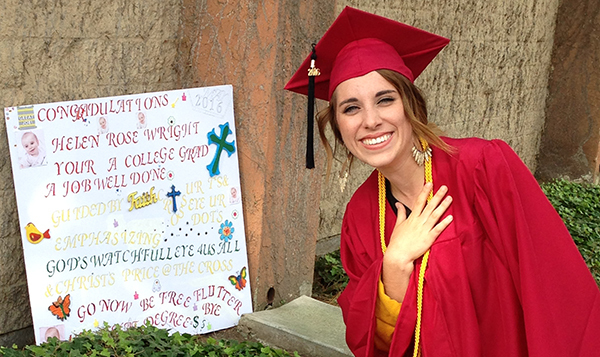 We love Pacific Crossroads Church in Los Angeles! They generously donated 50 food boxes for our families. 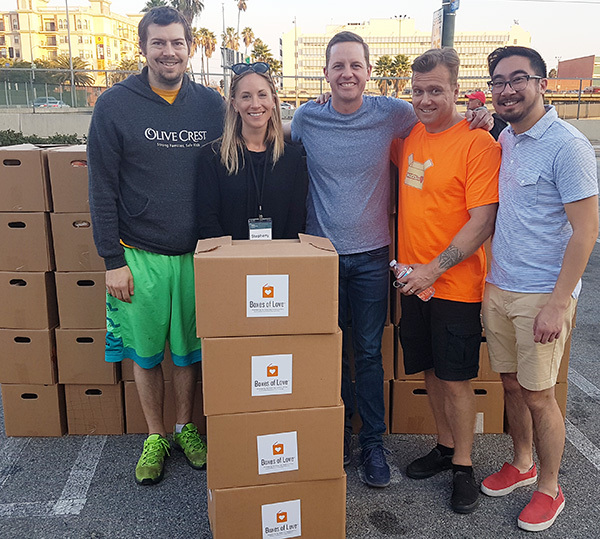 Each box was filled with non-perishable food items and included a $25 gift card to Ralphs, so the recipient family could purchase a turkey or ham. This was such a blessing to so many families and is just one example of how donor support helps meet urgent needs for Olive Crest families. Hey Jones Day, Look at Us Now! 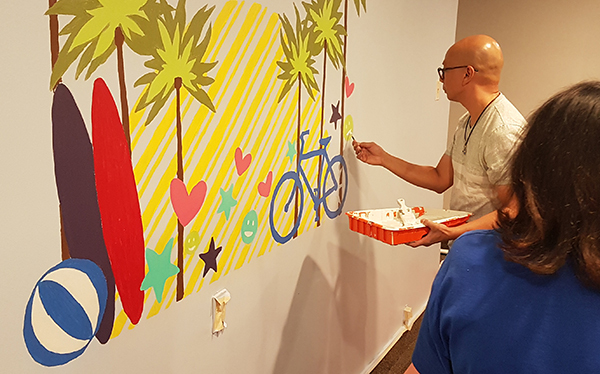 Jones Day law staff paints bright wall art. All of us at Olive Crest’s Los Angeles office are delighted with our beautiful new office update, thanks to one of our trustees, Erin Burke, and her amazing team at Jones Day Law Firm! On November 11, more than 60 volunteers, including the families of the Jones Day staff, spent the day revamping our Bellflower office, painting, putting furniture together, and so much more to make our offices more inviting. We can’t thank you enough, Jones Day! We’ve always had a great place to work, but you’ve made it even better.